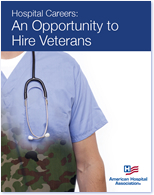 The AHA is excited to share with hospitals and health systems a new hiring resource, “Hospital Careers: An Opportunity to Hire Veterans.” Veterans with medical backgrounds can be excellent hospital employee candidates due to the numerous skills instilled through military training, including proactive leadership, strategic problem solving and ability to adapt and work under crisis conditions. Also, many veterans have the necessary credentials and licensure to practice immediately on separating from the military. The AHA collaborated on this project with the White House Joining Forces initiative. We look forward to helping those who have served our country find new ways to serve their communities. Please download the toolkit and learn more about this new potential pipeline of caregivers. Based upon anecdotal evidence from hospital and state hospital association leaders, veterans with the necessary AMO credentials and licensure to practice as an LPN, RN, NP, or PA have no impediments to being hired. In fact, qualified veterans bring enhanced skills to the workplace. In the health care setting, many of these abilities are highly desirable principles and standards that correspond directly to a hospital or health system’s own core values. Read more. Veterans Employment Center (VEC) – This site is the federal government’s single authoritative internet source for connecting transitioning service members, veterans and their families to meaningful career opportunities.